Southern Utah is home to a unique landscape filled with natural beauty. One of the best ways to explore the region is on a Southern Utah national parks vacation, during which you can visit the many parks in the area. From Zion National Park, which is known for stunning views of red rock canyons, to Bryce Canyon, recognized for towering spires that jut from the bottom of the canyon, these national parks offer travelers so much to explore. 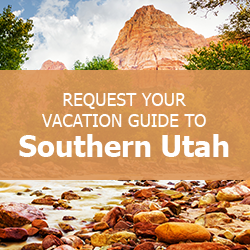 To learn more about other attractions in the area, be sure to download our complimentary Southern Utah Vacation Guide! Inside, you’ll discover tips on everything from restaurants to outdoor recreation. Across the southern half of Utah, you’ll find hundreds of hiking trails through varied landscapes ranging from easy to strenuous. No matter your level of experience or physical activity, you can find the perfect trail. One of the most popular attractions, Zion National Park, attracts many people to the area, making some of the easier, shorter trails more crowded than others. Bryce Canyon hiking trails can take you to some of the most beautiful viewpoints overlooking the awe-inspiring canyon, including sunset point. If you plan to drive through the region, you’re sure to discover gorgeous routes across the desert. One of the best-known paths to take is the Cedar Breaks National Monument scenic drive, which passes a beautiful spot for sunset viewing, the unique geological formation known as Chessman Ridge, an Alpine pond, and more. Follow the Zion Canyon scenic drive for 54 miles to drive alongside the Virgin River and arrive at another stunning lookout spot over the canyon. The entire drive will take about an hour and a half. The ample amount of land in Southern Utah provides the space and opportunity to test out a number of exciting outdoor activities. Test out one of the most popular activities and rent ATVs or sign up for a Zion ATV tour. Cruise over the bumpy, red rock terrain for a thrilling experience on the Zion National Park ATV trails. Avid rock climbers will want to try some of the bouldering areas of the park or embark on a guided mountaineering adventure. Stay in a Family Time Vacation Rental! While on your Southern Utah national parks vacation, you’ll want to select an accommodation that allows proximity to the parks. Book one of our Family Time Vacation Rentals located in several towns throughout the region, including Brian Head, Duck Creek Village, and Panguitch. With properties ranging in all sizes and varieties, we’re sure to have the perfect vacation home for you. Bring the entire family to this Great Escape property with enough room to sleep up to eight guests. Featuring a large bedroom, a loft area with beds, and a bonus room with a queen-size sleeper sofa, this home has everything you need for the perfect family getaway. Let the kids play in the bonus room each evening while you use the updated kitchen to make dinner. You’ll be just one mile from Duck Creek Village and less than an hour from the national parks. If you plan to rent ATVs for an extended period of time, there are plenty of trails and areas to ride them near the property.